Great Southwestern dedicates significant time and effort to ensure our safety training and orientation programs provide employees with the latest, most comprehensive and accurate information possible. This ensures they are properly trained in hazard recognition and mitigation when it comes to protecting themselves and others on the job, and well-versed in their abilities to maintain compliance with all company, OSHA and DOT safety rules, procedures and guidelines. Great Southwestern recognizes the importance of proper orientation for newly hired employees, and all are required to complete MYR Group’s New Hire Orientation Program at the time of hire or rehire. In addition, all field T&D employees must complete OSHA 10-hour training and all supervisory T&D employees must complete OSHA 20-hour training. Commercial & Industrial employees must undergo START (Supervisor Training in Accident Reduction Techniques) within their first year of employment. In addition to New Hire Orientation, regular and ongoing training is conducted for all employees. 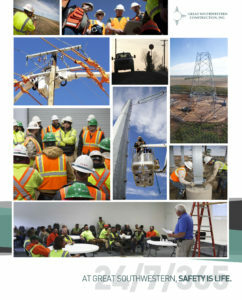 Subjects include CPR and First Aid, Hazardous Materials and Hazardous Communication, Trenching and Excavation, Confined Space Entry, Traffic Control and Barricading, Grounding Methods, Safe Work Practices, Pole-top Rescue, Material Handling, Lock Out/Tag Out, Energized Work Practices, Certified Crane Operator and others applicable to the specific job. Great Southwestern also provides augmented programs specific to Asbestos, Confined Space, Trenching and Excavation, Crane Safety, etc. Accident prevention is foremost in everyday operations. When we prepare for any job, we evaluate and discuss both the hazards involved and the necessary safety precautions to be taken. Weekly Safety Site Inspections on all jobs documented with photos and Job Site Safety Review Checklists. Safety Audits performed on the Transmission, Overhead/Under-Ground Distribution and the Substation Crews. Our president presents a “Managers Safety Plan” annually that clarifies the safety expectations and company goals for the upcoming year by addressing specific safety training needs and risk management goals. Signed commitments of supervisor are obtained, signifying a total commitment towards achieving the goals set forth. All close calls, near misses, incidents or accidents are thoroughly investigated and documented. Depending on the severity of the incident, an SAT Team (Safety Action Team) made up of managers and safety professionals may be dispatched to the scene. All information is shared with management and employees to prevent future occurrences. Great Southwestern proudly offers three Department of Labor Bureau-accredited appreticeship programs for employees desiring to become Transmission Linemen, Distribution Linemen or Substation Technicians. Visit our Apprenticeship Training page to learn more.